Safe area, do not waste money on public transport or taxis to get back to your hostel at night. Our location cannot be beaten by any other hostel in Brussels! 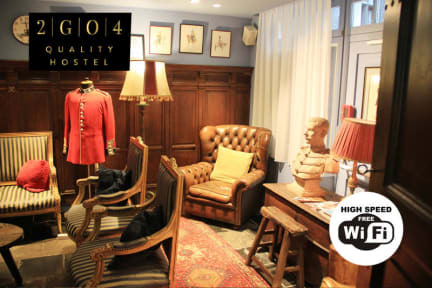 The hostel is in the best location in Brussels, ON THE GRAND PLACE, and offers great value for money! Stay in the historic mediëval city while you have the change! Now newly renovated dorm rooms available!! Although located in a quiet street all restaurants, pubs, snack bars and souvenir shops are close to the hostel. We offer 'newly renovated high quality dorm rooms' with en suite bathrooms at very affordable rates. We do not offer bicycle storage! In the first place we are a hostel! So we aim to keep our prices as affordable as possible on this amazing historical location!!! This location cannot be beaten by any other hostel in Brussels!!! Our philosophy: why always pay more for a 5 star location?.Currently to keep our prices affordable we eliminated the cost of a front desk staff member. Therefore to check-in do not go to haringstraat!! Our reception is at this check-in address: boulevard Emile Jacqmain 99, 1000 Brussels (see the directions to the hostel on our webpage 2go4, you can print it out!). So just a little effort for a great location! Reception at blvd Emile Jacqmain is closed from 13:00 until 16:00 (if we are there you can already store your luggage inside) and reception is also closed between 23:00 - 07:30 am. No lock-out nor curfew: : 24hrs access with key cards to your room! -notice we have an age limit for the dorm rooms: >35 years. The private rooms have no age limit. So if you are over 35, please book a private room. (minimum age 18 years). -notice we do not accept families with underage children! -there is a 1,5% charge for payments with credit card. - to maintain the philosophy and backpacking spirit of our hostel we do not accept large group bookings. -WE ARE NOT A PARTY HOSTEL ! Large group bookings are considered > 9 people. We will immediately cancel your large group booking(s), even if the bookings are made with separate bookings of < 9 people. You will also lose your deposit and service charge paid to Hostelworld. 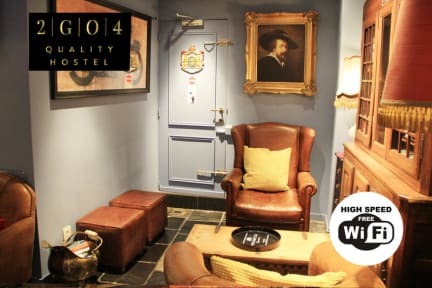 -luggage room available in 2go4 quality hostel (10min. Walk) or the central train station. - We don't accept group bookings of more than 9 people. The hostel is amazing, well located, clean and organized. Really new and the facilities are great. The only bad thing is the check in: it's in another address and takes 10/15 minutes walking to Grand Place. I definitely recommend it and would come back for sure. Boa localização. Ao chegar houve confusão por causa dos quartos pois disseram que havia outro hostel do mesmo grupo e que o check in era feito ali e depois mudava acabei por ficar neste primeiro mas tive de mudar de quarto na ultima noite. O primeiro quarto que fiquei ficava na cave, era extremamente quente pois os tubos de agua passavam por lá. Deveria ter mais chuveiros. A estadia foi muito boa no geral. O único real inconveniente é o check in ser feito em outro prédio, que não é muito perto para caminhar com as malas. No mais, foi o melhor hostel que já fiquei. A localização é ótima, porém, o atendimento é horrível. O check in é feito em um hostel, porém, o hostel é um outro local. Fui atendido no check in por duas meninas arrogantes que não sabem tratar o cliente com a minima postura sem nenhuma educação e cortesia. Parecia que estavam me fazendo um favor com uma postura sem educação. Não acharam a minha reserva, tuve que mostrar o papel de confirmação e ainda assim as duas não se importaram nenhum pouco em se desculpar ou lamentar o ocorrido. Em primeiro lugar, o check in é longe. Não são só 10 minutos. Pelo menos 20. Depois, lá no hostel, os quartos são super pequenos e confusos. O único funcionário que encontrei era antipatico e nem sequer me ajudou numas perguntas que lhe fiz. O único espaço comum fecha cedo e abre tarde. Lamento.